Hello readers, something a little different this time, as I wanted to discuss how some of the rules of the game work. More about the series at the end of this post. The idea for this specific post came to me while I was watching a video of Round 2 of the TTTD Online Tournament match between Jbouwme and Yort. Now, they are both veteran players and know the game well. But even veteran players can make mistakes. While they didn’t actually break any rules one of the players missed an opportunity because he either forgot or misunderstood exactly how the rules worked. Please note that while I have no desire to embarrass anyone, when doing a case study of an actual game that was played, I am going to have to mention some of the mistakes the players made. Please realize that just because they made a mistake in one game, that doesn’t make them bad players – I consider myself a decent player, and I not only make mistakes aplenty, I frequently document them in my weekly What Have You Played posts. 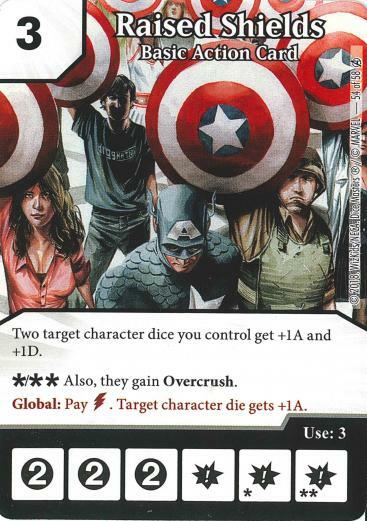 Yort has the following character dice which are unblocked: Two Sidekicks, a Level 3 Jimmy Olsen (2A) and a Black Widow. I can’t make out what level the Black Widow die is on, but I do hear Yort describing it as Level 3, which would make it 3A. Yort also has two bolts and two wild energy to use with the Raised Shields global, and Jbouwme has two masks and one wild energy to use with the Static Field global. At this point they get into a discussion about how priority works in this global window. They end up concluding that the way the rules work would allow Jbouwme to survive. Unfortunately, they were confused about how the rules worked at this point. Which meant they were mistaken about the defending player’s realistic chances of survival. Both players were clearly trying to do things the right way. But Yort made a critical oversight, and Jbouwme appears not to have realized it. From the discussion, the two players were under the impression that players alternate the use of globals in the global (and action dice) window of the Attack Step. While it can play out that way, it isn’t required to happen that way. I will paraphrase here the way the rules for the global window actually work. In the global window, the Attacking Player can take as many (or as few) actions as he wishes (and can pay for) then passes priority to the Defending Player. The Defending Player may take one action (this presumes they have the ability to pay the cost for that action) and then must return priority to the Attacking Player. Priority alternates in this fashion – Attacking Player takes as many actions as he or she likes (the number of which may be 0), then passes priority to the Defending Player, who may perform one action before returning priority to the Attacking Player. The global window ends when the Defending Player passes, (either through choice or inability to pay needed costs), followed by the Attacking Player passing (again, either through choice or inability to pay needed costs). Technically, the defending player can only perform one action (e.g. one use of one global) at a time. However, if they do perform an action, they guarantee the Attacking Player will be required to pass priority again, giving them the opportunity to take another action. Now the above might seem at odds with the common practice of the Attacking Player spending all of his (or her) energy on globals before passing priority, whereupon the Defending Player uses multiple globals themselves. It’s not, because the Attacking Player has the option to perform all the actions he or she is able to before passing priority. And, if the Attacking Player has nothing left to do, taking formal notice that priority is rebounding between the Attacking and Defending Players each time the Defending Player uses a global does nothing but waste time. Getting back to the game in our case study, what they didn’t properly account for was how (and when) the global window shuts. That happens when the attacking player does nothing after the defending player does nothing. At that point, the defender’s unused energy will end up going to waste (if the game continues it will be cleared in the Clear and Draw step when the turn changes) and play proceeds to the resolve damage step. Yort sounds like he thought he was obligated to pass priority to Jbouwme indefinitely. And, given the circumstances, that might have allowed Jbouwme to survive the turn. But he isn’t so obligated. If he passes priority and Jbouwme does nothing, all Yort has to do to win the game is . . . nothing. The global window shuts, his unblocked characters go through for 7A, and victory is his. So, let’s consider an alternate reality where Yort remembers how and when the global window shuts, and both players make the smart tactical choices. How does the turn play out? Yort can do as much or as little as he likes at this point. He doesn’t need to do anything (except pass priority at some point) and spending any of his energy here would limit his options down the road. He passes priority. Jbouwme has to do something here – if she doesn’t Yort can just let the window shut, at which point 4 unblocked characters deal her 7 damage and she loses. 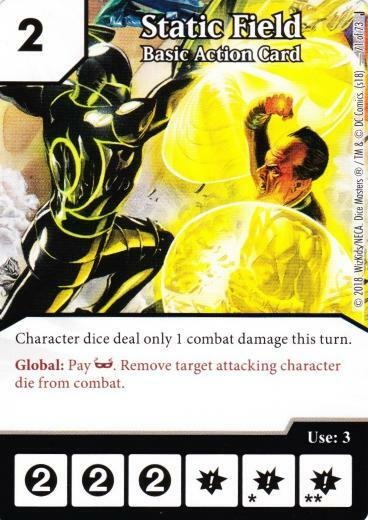 So she pays a mask and uses the Static Field global on Black Widow. She has taken an action, and she can only take one at a time, so priority returns to Yort. Yort doesn’t need to spend any energy here, and again, doing so would simply limit his options down the road. So he passes priority back to Jbouwme. Again, Jbouwme has to do something because if the window shuts here she’ll still take 4 damage. She pays her second mask to use the Static Field global on Jimmy Olsen. Priority returns to Yort. Yort now has two unblocked Sidekicks, and four energy he could potentially use for the Raised Shields global. Jbouwme has one last mask to use with the Static Field global. If he doesn’t increase the attack on his Sidekicks he’s only going to do 2 damage total, so Yort spends two energy to increase the A on his Sidekicks by 1 each, and passes priority back to Jbouwme. Yort still has two energy available to spend. Jbouwme spends her last mask to push back one of the Sidekicks. Yort now has one character die remaining that hasn’t been blocked or removed from the Attack Zone with the Static Field global. It is a Sidekick die that has already had its A increased one time. Yort spends his last two energy to buff his remaining unblocked Sidekick from 2A to 4A. Jbouwme has no mask energy left, and so cannot use the Static Field global again. We go to the Resolve Damage step, Yort’s unblocked Sidekick does 4 damage, reducing Jbouwme’s life total to 0, ending the game. Yes, Yort could have spent two energy to buff each of his Sidekicks by one at the start of the global window, and the end result would be the same. As you have seen, unless Yort makes a mistake, he can run Jbouwme out of masks while leaving himself enough energy he can buff his final unblocked character to at least 4A (which is all he needs). But, as you have also seen, there are other spots where he can potentially make those mistakes. In fact you can argue that, in the video, Yort compounds his mistake about the timing on the global window by buffing Black Widow and Jimmy before he buffed his Sidekicks. The mistakes Yort made didn’t cost him the actual game, but one might argue it cost Yort 12 extra minutes. Two-Team Takedown rounds are 90 minutes, so that’s about 13% of the available supply. It turned out not to matter here, true, but who’s to say it won’t matter next time? There you have it – a real life example of how even skilled, veteran players can mess up and shoot themselves in the foot because they misremembered an important rule in the heat of the moment. So I’ve said everything I feel needed to be said (written, if you want to be technical) about the game in the featured video. If someone submits a follow up question about anything I’ve said here I’ll try to address it, but otherwise, I’ve nothing more to add. But I do want to take some time to discuss what we intend it to be, and perhaps more important what it’s NOT intended to be. First, it’s not going to be a how to play guide for beginners. There are plenty of those available on the internet already, whether as YouTube videos, prose articles or a combination thereof. Most of them are very good, and we have no interest in recovering that ground. Second, it’s not going to be any kind of alternative to the WizKids Rules Forum. We love the game, or we wouldn’t be blogging about it, but we have no connection to WizKids, official or otherwise. Answering the kinds of question that should be getting answered by the rules forum isn’t our job, and we have no interest in pretending it is. So, that’s the two important points on what we don’t want it to be. So where DO we intend to go with it? The idea, especially in the beginning, is to take common game interactions which we have reason to suspect are poorly or at least imperfectly understood by a significant percentage of Dice Masters players and shine a spotlight on them. To go through them in detail – in meticulous detail if that’s what’s needed – and quite probably, in some cases, explain the difference between what’s customary and what is required. At the moment, how frequent Rules School posts will show up is yet to be decided. But, part of the reason we went to the trouble of declaring what Rules School isn’t going to be was we want to open the floor to suggestions. We have a few ideas of our own for future articles in this series, but we want to check and see it there are any subjects that fit under the Rules School mandate given above of particular interest to our readers. So if you have a suggestion to make along that line, please let us know in the comments. So, hopefully you were either entertained by or learned something from the above article – maybe even both. Thanks for reading, and don’t forget to send in those suggestions. But for now . . . Cool idea for an article series! I recommend spelling out the entire scenario in its totality at the beginning of the article. This article had some of the scenario info at the top (stats and board state) and some at the bottom (the actual interaction in question), which made for a confusing read if you haven’t watched the clip in question. Great article, nonetheless and I look forward to reading more!